The Lotus Development Corporation releases Lotus 1-2-3 for IBM computers. 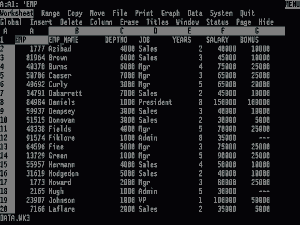 While not the first spreadsheet program, Lotus was able to develop 1-2-3 because the creators of VisiCalc, the first spreadsheet, did not patent their software. 1-2-3 outsold VisiCalc by the end of the year and 2 years later Lotus bought out the assets of VisiCalc and hired its main creator as a consultant.